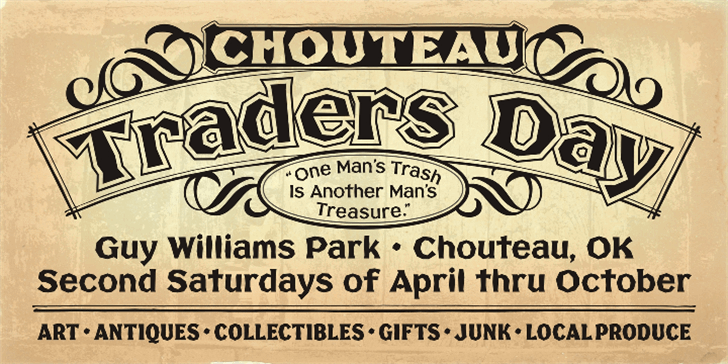 More than a century ago, Frank H. Atkinson presented this hand lettered style as Broken Poster. It was one of a hundred styles he demonstrated in his manual on sign painting. Even before his book was published (and certainly after), Broken Poster was a favorite with sign painters and letterers. It has graced show cards and movie posters, signs and windows displays, and advertisements of all varieties. We presented the our first digital revival of this classic in 2000. It is long overdue for an upgrade. 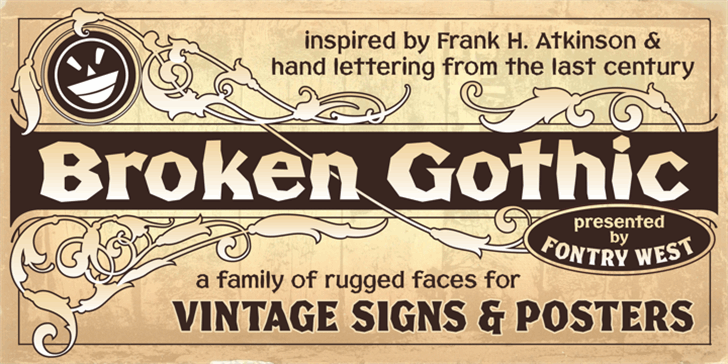 Broken Gothic expands the basic Broken Poster to four weights, two specialty formats and some cool layed effects. The language base includes Greek, Cyrillic, Latin A, and some of Latin B and Latin Extended. 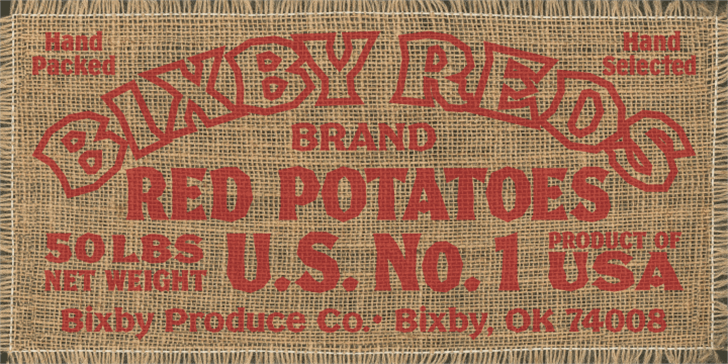 There are also some nice alternates and ligatures. All weights are quite suited to posters, headlines, display copy, web headers, etc. At first glance, Broken Gothic may seem to have limited uses. Give it a chance and it will surprise you. Broken shouts out that there is a sale, a giant monster or the end of the world. 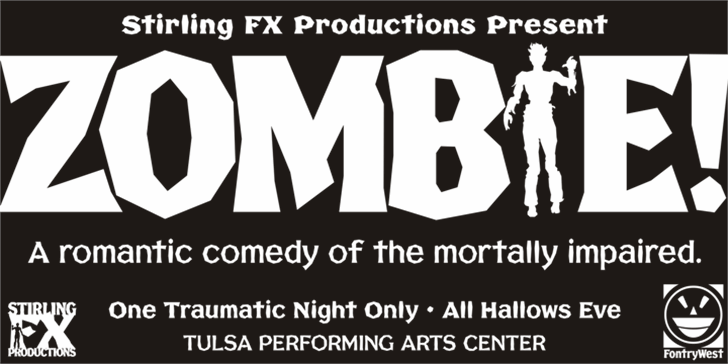 Broken Gothic is comfortable in a wide range of themes and applications from zombie movie titles to salsa jar labels. While I can't recommend it for text, Broken is great for headers, banners, signs, titles, product presentation and other display applications. 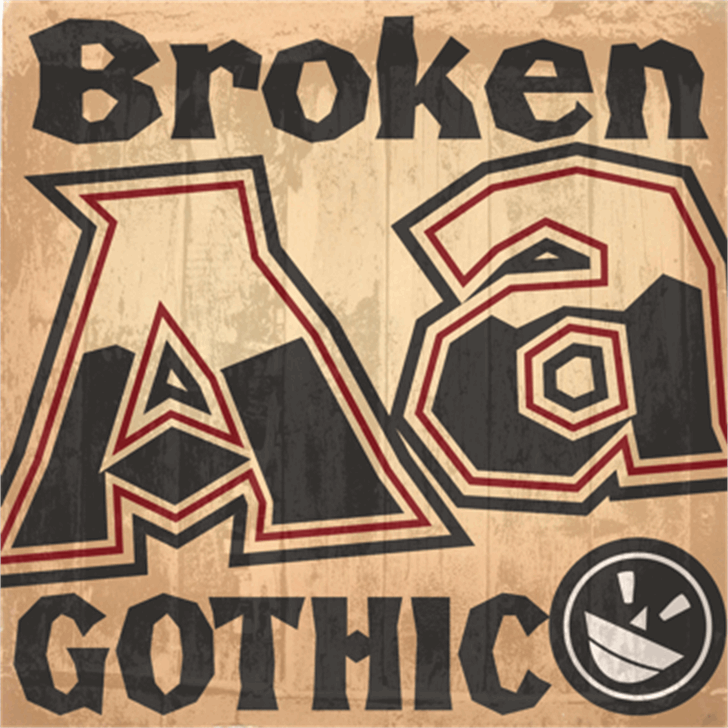 When you need a rough customer, Broken Gothic fills the bill. Copyright (c) 2000, 2007 & 2013 by The Fontry™ / Fontry West™, (Michael Adkins & James Stirling.) All rights reserved. Copyright (c) 2013 James Stirling and Fontry West. All rights reserved. Copyright (c) 2013 by James Stirling and Fontry West. All rights reserved. 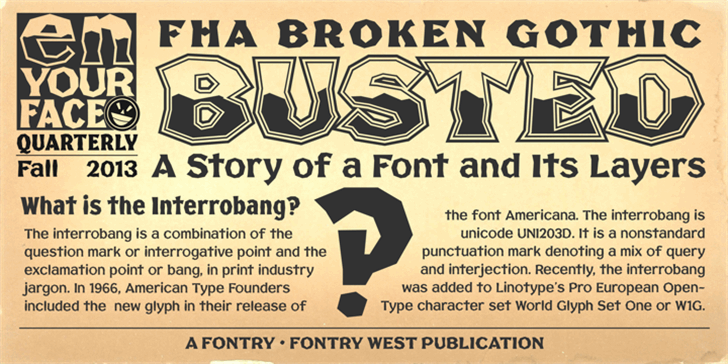 FHA Broken Gothic is a trademark of James Stirling and Fontry West.